To those consumers just beginning to delve into the world of home 3D printing there is a slippery slope upon inauguration. 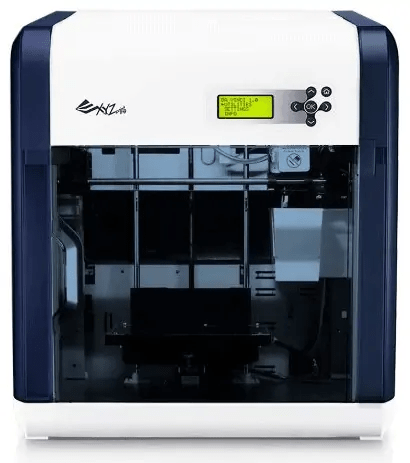 First of all you want a machine that is going to be relatively easy to set up and run as you just begin to get comfortable with all the nuances involved with creating models and fine-tuning the temperature settings and other controls on the printer. That being said, a printer that is too basic will be outgrown quickly and with typical entry level prices being $300 on up that’s quite a steep investment. On the other hand though a model that is too complicated and intended for advanced users will frustrate the novice and likely cause them to miss out on all the finer details involved in designing and printers. Da Vinci 2.0 – Is it Worth the Upgrade? It seems as if the Da Vinci is a trendsetter in the fact that it bucks all the recent trends of 3D printer manufacturers and their sleek, desktop-friendly design. The Da Vinci 1.0 is a load at 18.4” X 20” X 22” with a 20% higher build area than similar personal 3D printers at 7.8” X 7.8” X 7.8”. While the extra build volume is nice, many consumers consider the outlandish size more of wasted space than anything, especially for home use. The Da Vinci 1.0 really does have an industrial look with it’s bulky size and boxy design but really wouldn’t look out of place in a basement hobby area or finished garage. The Da Vinci 1.0 is moderately heavy weighing a little over 55 pounds but the manufacturers do include two large handles on each side for easy hauling and moving. Plus despite it’s square design the 3D printer does have a somewhat modern style of plastic and sheetmetal integration. If you want large build volume you do have to sacrifice in overall dimensions so it’s a real give and take. Heated Print Bed – A standard feature on most models these days is the heated print bed, which Da Vinci 1.0 has as well. Heated beds improve overall print quality by keeping the extruded plastic warm and prevent warping as the part cools at different times. Nozzle Cleaning Box – One of the innovations that people like most about the Da Vinci 1.0 is a self-cleaning box on the side of the print bed. This design implementation allows the nozzle to distinguish excess filament that has built up for cleaner print quality. To understand the concept think of a caulk gun or even a frosting dispenser that has a clean tip compared to one that has buildup all around the opening – it’s not hard to see which one flows cleaner and more efficiently. Another way the Da Vinci helps keep a well-maintained interior surface is with a drip tray that catches extra filament. On-Board Menu – The Da Vinci 1.0 Printer does have an on-board menu that helps the user control calibration in a simple manner. The unit has four print speeds: Fine (0.1mm), Standard (0.2mm), Speed (0.3mm), and Ultra (0.4mm) that can be controlled and directed with the push of a button. Depending on the complexity of the design these variable speeds can greatly reduce actual print time. 0.1mm Print Layers – In what has become another industry standard the Da Vinci 1.0 also prints very detailed 0.1mm layers which help to open up the realm of design possibilities. Design+ Cloud – 3D printing success is dependent on two main areas – the efficiency of the unit but also the practicality of the 3d model design. For those who may struggle with creating 3D models XYZprinting features a Design+ Cloud that is a community of designers that share their ideas. Here users can access 1,000’s of different solid models to download and send to their own 3D printers, a great way to get familiar with calibrating the machine. Closed Printing Area – Enclosed printing areas are nice for a number of reasons. First of all they close off the printed model to exposure to the elements, specifically temperature changes that can effect how well the design prints. Enclosed areas are also safer, especially as temperatures of the heat bed reach 80-90° and higher. Finally the enclosed area helps reduce the noise of the print – something that every 3D printer manufacturer struggles with. Internal Light System – A benefit of the enclosed printing area is being able to watch the printing process through a clear door, something that is made much more beneficial with an internal lighting system. The lights can be turned off manually but also do so automatically in the middle of a print and if the machine has been idle for awhile. 1-Year Warranty – XYZprinting includes a 1-year parts warranty from the manufacturer, something that shouldn’t be overlooked or excluded. The reason a 1-year warranty is so important is because the business model of XYZprinting is more quantity than quality and with plug&play, fully-assembled units there may be some issues that arise, especially as sales start to increase and so does the demand for product to stock shelves. I’ve compiled an “at a glance” chart for a simpler view of the key features that I tend to look at. For those unfamiliar with 3D printing software what it basically does is open up a model (created in AutoCAD, SolidWorks, or similar 3D software) and prepare it for reading by the printer. It resizes the model for fitting in the build volume and slices the part into layers that will be created by the printer and nozzle. The software used in the Da Vinci is called XYZware and although using a program designed only for use with one company may seem scary, the software is so bare-bones that it can be easily picked up. Many users report software crashes though, especially with larger files which effectively limits the productivity of the printer – you can’t print what you can’t send to the machine. Of course no 3D printer review would be complete without a listing of some of the flaws associated with the model. While some issues may arise on a case-by-case basis (software crashes, filament jams,) by most accounts XYZprinting was more than cordial, even in sending out replacement models under the warranty. The real issue people have is with some limitations on the 3D printer. For one, the Da Vinci 1.0 features only one nozzle which is starting to be archaic in the world of 3D printing. Also the Da Vinci works with only XYZ brand filament as the slots are designed to take only their cartridges. It’s not a bad business move on their end but of course it limits the consumers pricing and color options. Finally, the Da Vinci prints only in ABS while virtually every machine in the industry is both ABS and PLA compatible. These big issues is where many people devise their “you get what you pay for” sentiment. One thing that XYZprinting has proved is their ability to evolve, taking into consideration customer issues in the process. Besides many firmware updates the company has also released the Da Vinci 2.0 which solves two main conceived design flaws by adding a second extruder and the ability to print in both ABS and PLA. While the unit is more costly at $649 (see here) those two big additions are game changers compared to the 1.0 release. All in all, people need to realize that 3D printing represents a pretty significant investment. $500 isn’t an exorbitant amount of money to spend to learn and perfect a new skill. Think of the Da Vinci 1.0 as that first 125cc motorcycle that you buy to learn on ride it into the ground. You’ll eventually outgrow the bike but it’s still fun to ride – kind of the Da Vinci 1.0 in a nutshell. You can see the latest pricing here.